In a continuing effort to improve communication, the board has set up this forum for homeowners to ask questions directly to the Board of Directors. We will select the most asked questions and provide the answers here. Please provide your name and address. We will not post either. Please focus on subjects that will pertain to several residents, rather than just an individual concern. We will respond as quickly as possible to as many questions as possible. Does the HOA have a policy regarding drones? Had a fly-over my backyard Sun 4/29/18. Most drones have cameras attached, find this to be an invasion of privacy. Currently Suffolk County does not have any laws on the books preventing drones from flying over private property, however that is changing on a constant basis. The FAA controls the airspace over Long Island and they do put restrictions on drones within the glide paths of the airports. In addition, each town or municipality can place restrictions on drones within the confines of their town. Brookhaven, at this time, has no such laws on the books that we can find. You are free to call the Town and make a complaint about the drone you saw. Once again, this technology is changing at a rapid pace and the laws are just starting to catch up to it. In closing, the HOA does not own the airspace over the community and as such we can make no rules as to who can use it. We are subject to the laws of the Town and the County. Why was delivery of new trash cans put on hold? The Board has many questions and concerns regarding size, storage, color, collection, etc. of the proposed new cans and ongoing conversations with Maggio's are continuing. Is there any program for Rodents? I know certain areas of the community are having an issue with rats... if some have them, everybody has a possibility... additionally when they build on the other side of Canal Road, whatever lives there has a strong possibility of coming here. Due to the sheer size of our community (approx. 64 acres of common ground) there is no way possible to implement a rodent control program at a cost that would be manageable to the association. We do ask (and the Prospectus specifies) that homeowners be somewhat careful. Everyone is urged to use common sense and not place trash at the curb prior to the night before pickup, in order to reduce the chance of attracting rodents. In addition, the Town of Brookhaven prohibits the feeding of wildlife. The distribution and storage of that food will also attract rodents. Thank you for your question. I have noticed many tracks and holes in the grass throughout both the common area and in soil area of my patio. I believe it may be from either moles or voles or some type of underground creature. I was wondering if the grounds people have noticed this as well and what the plan of action is, if any? At this time we have no plan in place to deal with moles, which are a common pest in this area. Any individual homeowners are welcome to apply mole repellent to their lawns if they wish. Reading the minutes of the last meeting I saw that a solar project was narrowly approved. I feel that any project over $100,000 should need the approval of the entire community, especially since we would be borrowing half of the cost Were rebates available? How can we afford to borrow money? When would this "pay for "itself? Why did 4 board members vote NO. There must be a good reason. First off we want to thank you for reading the Board meeting minutes. It's nice to know some people do keep informed. Everyone in the community has the opportunity each and every year to run for and vote for board members whom they want to see guide the community for the next 3 years. That is exactly what the board does, guide the community. The board is put in place to make decisions for the entire community. It would be impractical to have a community vote every time the board takes up a project and nothing would ever get done. It’s hard enough with a nine member board, which in itself is a very large and diverse group. Everyone on the board has an opinion which is expressed at every meeting, especially with projects of this size. The goal is to get consensus and a majority of five of nine “yes” votes is required. As far as this project is concerned, we are using a company that is well versed in working with not-for-profit organizations. We are receiving all the rebates and grants available to us. In addition, the financials of this project are projected to yield an influx of funds to the community over time. We will be owning this system. It is not a lease situation. With the constant rising cost of electricity on Long Island our savings can only increase. Just had an idea, which will probably be laughed down... but here goes anyway: What fun it would be if each month a drawing of residents in good standing was to be held and one winner is allowed to skip their HOA bill for the month! So that would be $2100.00 per year less into the HOA funds. Too much? Then how about a drawing every other month @ $1050.00 per year less into HOA. Lots of community spirit, and the drawing could be held on First Friday game night! Opinions? This is a very interesting concept however we think it is inappropriate at this time. Once the community gets to the point where the financials are in better shape and we see that our common charge payment rate is closer to 90%, we can revisit this. At this time we are just trying to maintain community services with the monies we have. I am considering installing solar panels, what do I need to do for approval? Installing solar roof panels on your home within the HOA is considered to be a homeowner modification. As such you must submit a homeowner modification form which can be found on the HOA website. NOTE: Your roof must be in good condition and within the age range for your roof. Your roof should be inspected by the solar company to be sure of that. You are responsible for insuring the entire dwelling. Strathmore Court is NOT a condominium community and therefore you need homeowners insurance, specifically an HO3 coverage policy. Your insurance must cover the entire house, both inside and outside and should include liability coverage as well. 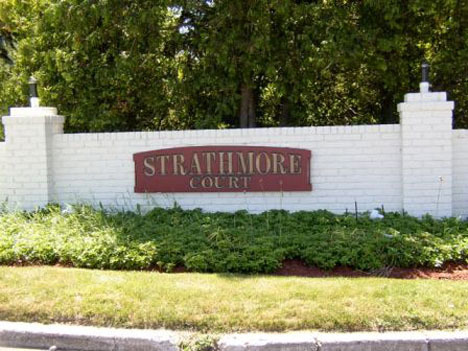 As Strathmore Court is a community of Townhomes, you are required to have an HO3 policy. We recommend that you discuss your needs with an insurance professional. Explain that you have bought a single family semi- or fully attached home. I see the board has raised the monthly HOA charge to $175. I feel this matter should have been voted on by the entire community. The operation of the board and management company should be more transparent, including the monthly meetings which are not open to the community. According to article 10 of the SCHOA prospectus, the board has the ability to raise the common charge up to 10% of the current charge ($160.00 X10% = $16) without community approval. In fact, the common charge has not been raised in the past 8 years. As we all know very few of the costs that go into the running of this community have gone down in the past 8 years. We have the lowest common charges in Suffolk County. At the monthly board meetings, which are held in closed session, we discuss matters that pertain to individual homeowners, such as legal and financial. In addition, we also may discuss matters of a sensitive nature, which we would not be allowed by law to disclose to the general community. We do provide several meeting and socials per year where community members can meet with board members on a one to one basis to discuss matters important to that particular homeowner. The minutes of every monthly board meeting are published on the website and you may request notification be sent to you by e–mail when they are available. The prospectus only requires one open meeting be held each year and that is at the annual meeting and election. The Board is always looking for homeowners to contribute, and board members can be contacted either individually or as a group by using the emails listed on the strathmorecourt.com website. Anyone parking more than one foot from the curb is in violation of Brookhaven Town code. The HOA has no jurisdiction over parking or the streets, as they belong to the Town. If you feel as if someone is parking illegally and causing a hazard, please call the non-emergency police number at the 6th Precinct - Coram, NY - (631) 854-8600 and report it. When there is time (remember, this is a NON-Emergency) they will send a car and ticket the offender. Why did the homeowners association remove the center islands and what did it cost us? The islands, like the roads in our community, are Town of Brookhaven property. The town decided the islands impeded emergency vehicles and snow removal equipment and chose to remove them. The Board of Directors did not propose or influence this decision. The project cost the homeowners association nothing, as it was paid for by the Town of Brookhaven. This was part of a $2 million dollar budget item earmarked for Strathmore Court for 2016, 2017 and 2018. In addition to the island removal, the town is planning to repair and replace curbs and aprons, repave all roads in the community and correct some drainage problems. I was interested in converting to natural gas and placed a deposit with Fairway Plumbing. Can the Homeowners Association help me get my deposit back?